The long awaited Naidex Exhibition is upon us again, and we cannot wait for it to start! The Naidex expo, Held at the NEC, Birmingham on the 26th-28th of April, is the UK’s largest disability, rehabilitation and homecare event with many different companies and people attending. This is always a great exhibition to attend, and we cannot wait to get setup. This year, we will be exhibiting our range of daily living aids at the Naidex exhibition, to give out to the general public and share information about the brands! We at Tenura also love making new connections with exhibitors and attendees, to hear about the many interesting innovations this area often has. Tenura’s repre­sen­ta­tives, Chris and Stuart, will be at Stand – C20 throughout the exhibition, please don’t hesitate to drop by and say hello! We have a feeling this years exhibition will be very useful and fun to attend! To keep up with us all the way, make sure to follow our social media on Facebook & Twitter. These will be regularly updated with photos of how the expo is going! Posted in Daily Living Aids, Exhibitions, Independent Living, Internet, Social Media, Tenura Updates and tagged Tenura, Independent living aids, Naidex, Naidex 2016, Disability aids, Independent living, daily living aids on 4th February 2016 . In daily life, preparing and eating food is a necessity. This should be as easy as possible and be a pleasant experience. Unfortunately for those suffering from diseases like arthritis and Parkinson's, preparing a meal can be a painful and stressful process. In fact using any utensils like toothbrushes, pens, and many other items can be a struggle. Thankfully, Tenura has created a product to help in situations just like this! Tenura cutlery grips create an enlarged surface area around small objects that are hard to use and hold. Cutlery grips have two slits in the middle of the material, allowing the objects to sit in without leaving space for movement, making using these utensils a more comfortable experience. Food preparation can be hard for those who suffer from impairments to strength of grip, from pain to struggling to hold implements sufficiently, it can become a challenge very quickly instead of a day to day task. 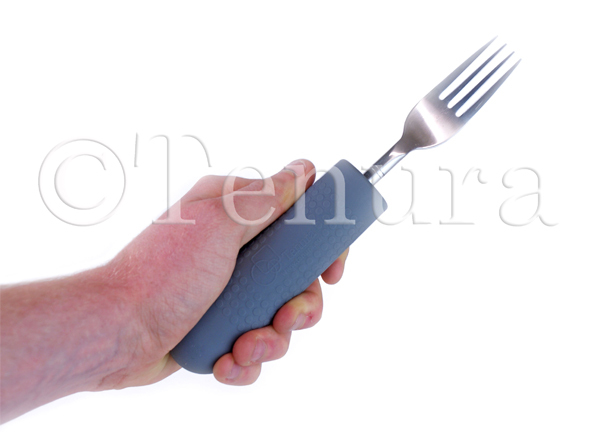 Tenura cutlery grips can increase the surface area of the object and make it easier to grip and hold. This makes preparing food easier, less painful and safer. Cutlery grips can be washed with ease, an application of soap and hot water will be enough to guarantee a good level of hygiene and make them ready to use again and again! After you have slaved away in the kitchen comes the best part of the process, the eating of the food. This process should be enjoyable after you have worked hard to prepare a meal. But for those with hand impairments or impairing diseases, the eating of the food can be very difficult. Items like knives and forks can be very difficult to hold and use effectively. 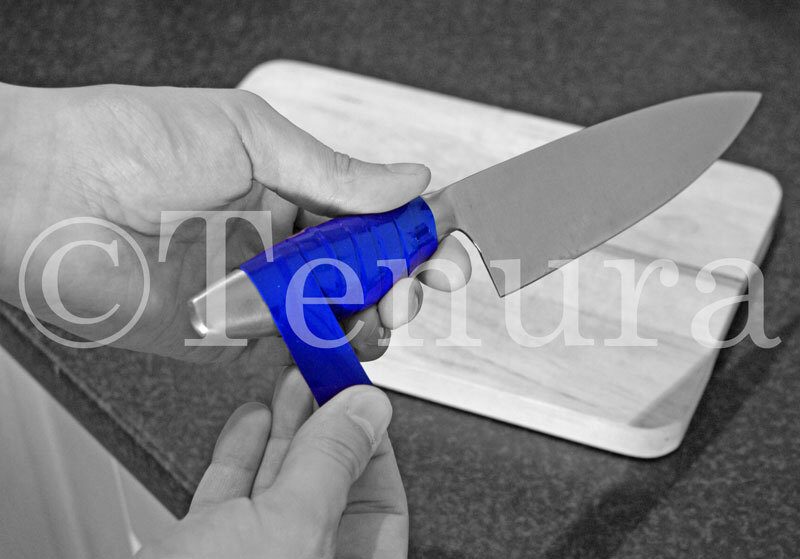 Tenura cutlery grips can make knives, forks and spoons much easier to use and a less painful. Writing is an essential skill that is needed almost all the time. From a very young age, most of us learn the skill of writing. Unfortunately as you age, diseases and accidents can sometimes impair your ability to do this. Arthritis can make precise movements with your hand painful and hard to do. Thankfully, Tenura cutlery grips can provide a enhanced surface area around pens and pencils making them easier to hold. This will relieve some of the pain involved when trying to hold the pen or pencil tightly enough to use effectively. Tenura cutlery grips help to make writing easier and more comfortable, and maintaining an important skill. Brushing your teeth is a vital part of day to day life. Without clean teeth, tooth decay is inevitable. This can lead to a painful toothache and expensive surgery to get it corrected. Unfortunately, moving a toothbrush around your mouth requires a certain level of precision in where the brush is going and the pressure being applied to the brush. These two things can be very difficult for those who suffer from arthritis and other impairments. 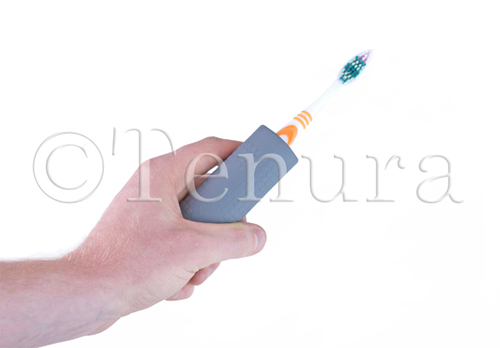 Using and holding a tooth brush effectively can also be a very difficult experience. Cutlery grips can be applied to any standard toothbrush with ease, allowing you to manoeuvre the toothbrush around your mouth and grip the brush easier. This will decrease the chance of injury to gums and teeth that could happen without this support and make this important daily task much easier to accomplish. Cutlery grips are great aid to day to day life and allow tasks that need you to grip and use small items in much more comfort. For more information regarding Cutlery grips or the rest of the Tenura range, please visit the website. Posted in Arthritis Aids, Assisted Living, Daily Living Aids, Independent Living, Social Media, Tenura Updates and tagged Tenura, cutlery grips, daily living, daily living aids, independent living aids, living aids, Tenura cutlery grips on 4th November 2015 . Spillages are a common nuisance in day to day life, creating a mess which can take time and effort to clean up. Spills can also lead to slips and falls which can cause serious injury. Diseases like Parkinson’s and Arthritis make people very prone to spills and messes due to the effect the disease has on their movement. 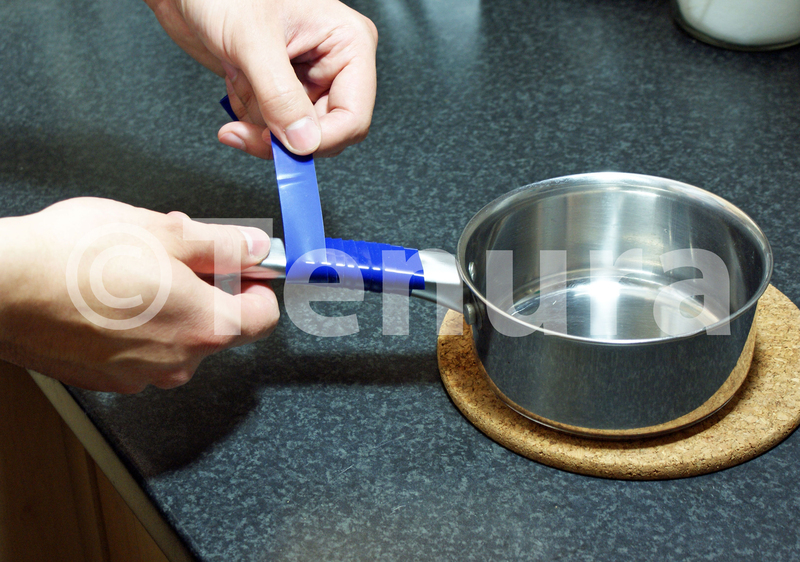 Luckily, Tenura has created a product which creates a strong non slip surface wherever you place your cup or mug! 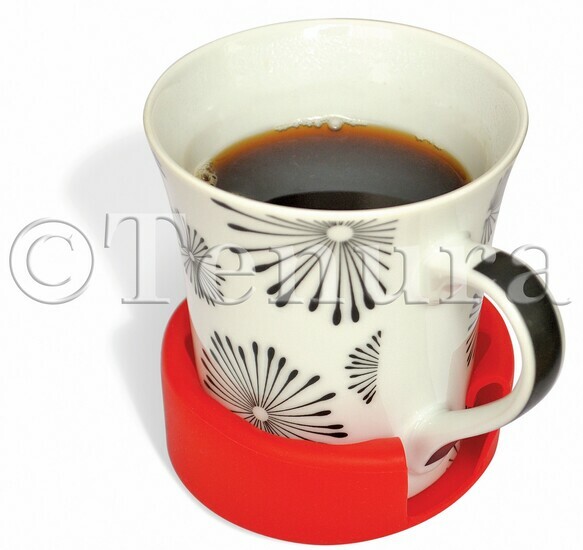 Tenura silicone antimicrobial moulded cup holders work just like a regular coaster but are fitted to the bottom of a cup or mug. This allows you to create an anti slip grip wherever you need it, helping to prevent nasty spills and stains in day to day life. Hot liquids can create very unpleasant spills and messes, especially if spilt on yourself or others. Tenura cup holders can provide a firm non slip surface to help prevent this from happening, this material will also catch any small spills, preventing stains on clothing, fabrics or tables and chairs.Tenura cup holders can be applied to any cups or mug with ease, simply take your cup or mug and slip it into the seat inside the product, the silicone material will then form a strong non slip grip underneath and around the cup preventing it from moving. The material will also form a strong grip with any flat surface it is placed upon, preventing unwanted movement which could lead to the cup being knocked over. Tenura cup holders antimicrobial properties are another benefit that makes this product so beneficial. No bacteria or dirt can grow or harbor on this material. A combination of hot water and soap is more than enough to keep this material clean and hygienic, ready for its next use. Cup holders are also made from 100% silicone and non toxic, meaning no phthalates are present in our materials, keeping you and your family safe from the damage these chemicals can cause. 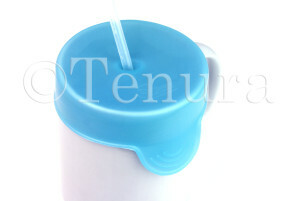 Tenura Cup Caps are a great product to combine with Tenura cup holders to help prevent spills and stains when lifting and drinking from cups, cans and mugs! This product creates a strong seal over the top of most cups and mugs, preventing the liquid from spilling while allowing you to drink through a straw which can be placed through a small valve in the middle of the material. This can be done by simply stretching the material over the top of a cup, mug or can. The material will then form a strong grip with the sides of the cup/mug and stop liquid from spilling out. Tenura cup holders can be found in Red blue and yellow colours, while cup caps can be found in packs of one 80mm and one 60mm cup cap. By combining these two products you can minimize the chances of spills and stains while still being able to enjoy hot or cold drinks in the house or on the go! Tenura cup holders, cup caps and the rest of the Tenura range can all be found on our website. Posted in Arthritis Aids, Assisted Living, Daily Living Aids, Independent Living and tagged anti slip coasters, anti slip cup holder, cup holders, independent living aids, moulded cup holders, tenura, tenura cup holders on 9th October 2015 .